(S) Mens 1970's Long Sleeve Western Shirt Cool Orange & Brown designs NEVER WORN! 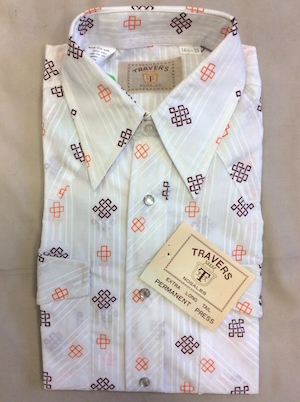 Home > Men's Vintage Shirts > Western Shirts > (S) Mens 1970's Long Sleeve Western Shirt Cool Orange & Brown designs NEVER WORN! Vintage 1970's Mens long-sleeve Western shirt. 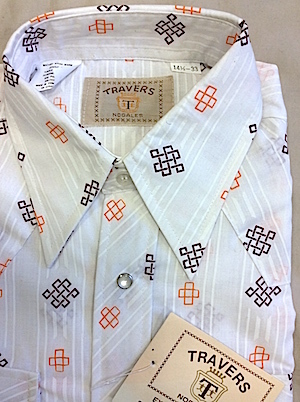 White base with Orange and Brown geometric designs. Pearly white snaps with snap closure patch pockets on each side. Long, pointy 1970's collar. Tagged by Travers. 65/35 poly-cotton.